Last two articles was about Offline and Online charging interfaces. So now, after we know "how the things are are going" in charging domain, it's a good time to describe how UEs are able to being charged for services they receive. Always it's good to start with a high level abstract picture, but not today. Being honest, today I'm a little bit lazy and just don't want to draw network architecture myself. You can easily find that on Google image search engine. Information below are part of 3GPP TS 23.401, I just copied them. Below is everything you need to know about Network Attach procedure in LTE with many references. UE needs to register with the network to receive services that require registration. This registration is called Network Attachment. The always on IP connectivity for UE is enabled by establishing a default EPS bearer during Network Attachment procedure. Predefined PCC rules most common set in PGW will be applied for default bearer. Attach procedure may trigger one or multiple Dedicated Bearer Establishment procedures to establish dedicated EPS bearer for that UE. During the Initial Attach procedure the Mobile Equipment Identity is obtained from the UE. The MME operator may check the Mobile Equipment Identity with EIR. At least in roaming situations, the MME should pass the ME Identity to the HSS, and, if a PGW outside of the VPLMN (Visited PLMN), should pass the ME Identity to the PGW. The E-UTRAN Initial Attach procedure is used for Emergency Attach by UEs that need to perform emergency service but cannot gain normal services from the network. These UEs are in limited service state (more about this in 3GPP TS 23.122). Also UEs that had attached for normal services and do not have emergency bearers established and are camped on a cell in limited service state shall initiate the Attach procedures indicating that the attach is to receive emergency services. UEs that camp normally on a cell, i.e. UEs that are not in limited service state, should initiate normal initial attach when they are not already attached and shall initiate the UE Requested PDN Connectivity procedure to receive emergency EPS bearer services. Maybe you will find Combined Attach information interesting as well. After this description we will jump straight into how the Network Attach is being completed step by step. 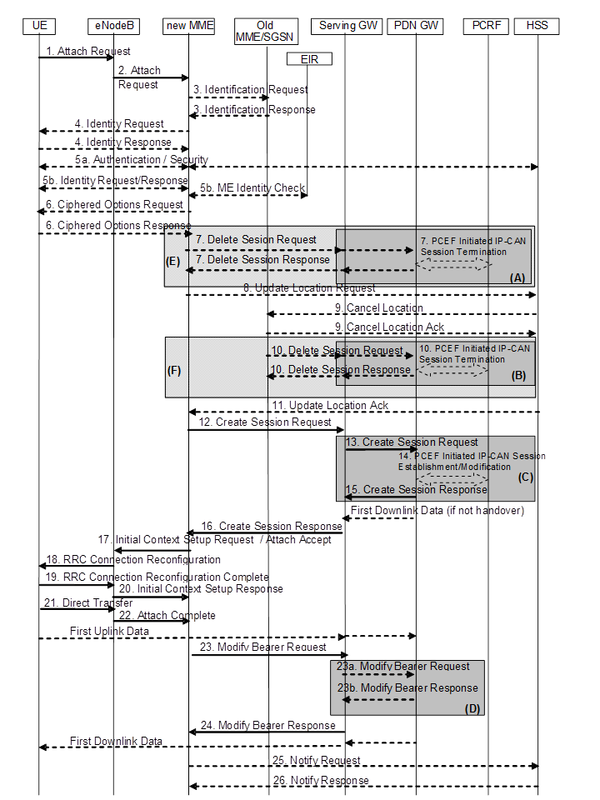 NOTE 1: For a PMIP-based S5/S8, procedure steps (A), (B), and (C) are defined in 3GPP TS 23.402. Steps 7, 10, 13, 14, 15 and 23a/b concern GTP based S5/S8. NOTE 2: The Serving GWs and PDN GWs involved in steps 7 and/or 10 may be different to those in steps 13 and 15. NOTE 3: The steps in (D) are executed only upon handover from non-3GPP access. NOTE 4: More detail on procedure steps (E) is defined in the procedure steps (B) in 3GPP TS 23.401. NOTE 5: More detail on procedure steps (F) is defined in the procedure steps (B) in 3GPP TS 23.401 . Step 1. The UE initiates the Attach procedure by the transmission, to the eNodeB, of an Attach Request (including inter alia IMSI or old GUTI) message together with RRC parameters indicating the Selected Network and the old GUMMEI. The old GUTI may be derived from a P-TMSI (Packet Temporary International Mobile Subscriber Identity) and RAI (Routing Area Identification). IMSI shall be included if the UE does not have a valid GUTI or a valid P-TMSI available. The UE stores the TIN (Temporary Identity used in Next update) in detached state. If the UE's TIN indicates "GUTI" or "RAT-related TMSI" and the UE holds a valid GUTI then the old GUTI indicates this valid GUTI. If the UE's TIN indicates "P-TMSI" and the UE holds a valid P-TMSI and related RAI then these two elements are indicated as the old GUTI. Mapping a P-TMSI and RAI to a GUTI is specified in 3GPP TS 23.003. If the UE holds a valid GUTI and the old GUTI indicates a GUTI mapped from a P-TMSI and RAI, then the UE indicates the GUTI as additional GUTI. If the old GUTI indicates a GUTI mapped from a P-TMSI and RAI and the UE has a valid P-TMSI signature associated to it, the P-TMSI signature shall be included. The UE sets the voice domain preference and UE's usage setting according to its configuration. If available, the last visited TAI (Tracking Area Indicator) shall be included in order to help the MME produce a good list of TAIs for any subsequent Attach Accept message. Selected Network indicates the PLMN that is selected for network sharing purposes. The RRC parameter "old GUMMEI" takes its value from the "old GUTI" contained in the Attach Request. If the UE has valid security parameters, the Attach Request message shall be integrity protected by the NAS-MAC in order to allow validation of the UE by the MME. KSIASME, NAS sequence number and NAS-MAC are included if the UE has valid EPS security parameters. NAS sequence number indicates the sequential number of the NAS message. If the UE does not have a valid EPS security association, then the Attach Request message is not integrity protected. In this case the security association is established in step 5a. The UE network capabilities indicate also the supported NAS and AS security algorithms. PDN type indicates the requested IP version (IPv4, IPv4/IPv6, IPv6). Protocol Configuration Options (PCO) are used to transfer parameters between the UE and the PGW, and are sent transparently through the MME and the Serving GW. The Protocol Configuration Options may include the Address Allocation Preference indicating that the UE prefers to obtain an IPv4 address only after the default bearer activation by means of DHCPv4. If the UE intends to send PCO which require ciphering (e.g., PAP/CHAP usernames and passwords) or send an APN, or both, the UE shall set the Ciphered Options Transfer Flag and send PCO or APN or both only after authentication and NAS security setup have been completed. If the UE has UTRAN or GERAN capabilities, it shall send the NRSU in the PCO to indicate the support of the network requested bearer control in UTRAN/GERAN. Request Type is included in the ESM message container and indicates "Handover" when the UE has already an activated PGW/HA due to mobility with non-3GPP accesses. Attach Type indicates whether it is an EPS attach or a combined EPS/IMSI attach or an Emergency Attach. For an Emergency Attach the UE shall set both the Attach Type and the Request Type to "Emergency" and the IMSI shall be included if the UE does not have a valid GUTI or a valid P-TMSI available. The IMEI shall be included when the UE has no IMSI, no valid GUTI and no valid P-TMSI. Step 2. The eNodeB derives the MME from the RRC parameters carrying the old GUMMEI and the indicated Selected Network. If that MME is not associated with the eNodeB or the old GUMMEI is not available, the eNodeB selects an MME. The eNodeB forwards the Attach Request message to the new MME contained in a S1-MME control message (Initial UE message) together with the Selected Network, CSG (Closed Subscriber Group) access mode, CSG ID, and TAI+ECGI of the cell from where it received the message to the new MME. CSG ID is provided if the UE attaches via a CSG cell or hybrid cell. CSG access mode is provided if the UE attaches via a hybrid cell. If the CSG access mode is not provided but the CSG ID is provided, the MME shall consider the cell as a CSG cell. If the MME is not configured to support Emergency Attach the MME shall reject any Attach Request that indicates Attach Type "Emergency". Step 3. If the UE identifies itself with GUTI and the MME has changed since detach, the new MME uses the GUTI received from the UE to derive the old MME/SGSN address, and send an Identification Request (old GUTI, complete Attach Request message) to the old MME/SGSN to request the IMSI. If the request is sent to an old MME, the old MME first verifies the Attach Request message by NAS MAC and then responds with Identification Response (IMSI, MM Context). If the request is sent to an old SGSN, the old SGSN first verifies the Attach Request message by the P-TMSI signature and then responds with Identification Response (MM Context). If the UE is not known in the old MME/SGSN or if the integrity check or P-TMSI signature check for the Attach Request message fails, the old MME/SGSN responds with an appropriate error cause. The MM context contains security related information as well as other parameters (including IMSI). The additional GUTI in the Attach Request message allows the new MME to find any already existing UE context stored in the new MME when the old GUTI indicates a value mapped from a P-TMSI and RAI. For an Emergency Attach if the UE identifies itself with a temporary identity that is not known to the MME the MME immediately requests the IMSI from the UE. If the UE identifies itself with IMEI, the IMSI request shall be skipped. NOTE 6: A SGSN always responds with the UMTS security parameters and the MME may store it for later use. Step 4. If the UE is unknown in both the old MME/SGSN and new MME, the new MME sends an Identity Request to the UE to request the IMSI. The UE responds with Identity Response (IMSI). Step 5a. If no UE context for the UE exists anywhere in the network, if the Attach Request (sent in step 1) was not integrity protected, or if the check of the integrity failed, then authentication and NAS security setup to activate integrity protection and NAS ciphering are mandatory. Otherwise it is optional. If NAS security algorithm is to be changed, the NAS security setup is performed in this step. If the MME is configured to support Emergency Attach for unauthenticated IMSIs and the UE indicated Attach Type "Emergency" the MME skips the authentication and security setup or the MME accepts that the authentication may fail and continues the attach procedure. After step 5a, all NAS messages shall be protected by the NAS security functions (integrity and ciphering) indicated by the MME unless the UE is emergency attached and not successfully authenticated. Step 5b. The ME Identity shall be retrieved from the UE. The ME identity shall be transferred encrypted unless the UE performs Emergency Attach and cannot be authenticated. For an Emergency Attach, the UE may have included the IMEI in the Emergency Attach. If so, the ME Identity retrieval is skipped. In order to minimise signalling delays, the retrieval of the ME Identity may be combined with NAS security setup in step 5a. The MME may send the ME Identity Check Request (ME Identity, IMSI) to the EIR. The EIR shall respond with ME Identity Check Ack (Result). Dependent upon the Result, the MME decides whether to continue with this Attach procedure or to reject the UE. For an Emergency Attach, the IMEI check to the EIR may be performed. If the IMEI is blocked, operator policies determine whether the Emergency Attach procedure continues or is stopped. Step 6. If the UE has set the Ciphered Options Transfer Flag in the Attach Request message, the Ciphered Options i.e. PCO or APN or both, shall now be retrieved from the UE. In order to handle situations where the UE may have subscriptions to multiple PDNs, if the Protocol Configuration Options contains user credentials (e.g. user name/password within PAP or CHAP parameters) then the UE should also send the APN to the MME. Step 7. If there are active bearer contexts in the new MME for this particular UE (i.e. the UE re-attaches to the same MME without having properly detached before), the new MME deletes these bearer contexts by sending Delete Session Request (LBI) messages to the GWs involved. The GWs acknowledge with Delete Session Response (Cause) message. If a PCRF is deployed, the PGW employs an IP-CAN Session Termination procedure to indicate that resources have been released. Step 8. If the MME has changed since the last detach, or if there is no valid subscription context for the UE in the MME, or if the ME identity has changed, or if the UE provides an IMSI or the UE provides an old GUTI which doesn't refer to a valid context in the MME, or for some network sharing scenario (e.g. GWCN) if the PLMN-ID of the TAI supplied by the eNodeB is different from that of the GUTI in the UE's context, the MME sends an Update Location Request message to the HSS. The MME capabilities indicate the MME's support for regional access restrictions functionality. ULR-Flags indicates "Initial-Attach-Indicator" as this is an Attach procedure. Homogenous Support of IMS Over PS Sessions indicates whether or not "IMS Voice over PS Sessions" is supported homogeneously in all TAs in the serving MME. For an Emergency Attach in which the UE was not successfully authenticated, the MME shall not send an Update Location Request to the HSS. Step 9. The HSS sends Cancel Location (IMSI, Cancellation Type) to the old MME. The old MME acknowledges with Cancel Location Ack (IMSI) and removes the MM and bearer contexts. If the ULR-Flags indicates "Initial-Attach-Indicator" and the HSS has the SGSN registration, then the HSS sends Cancel Location (IMSI, Cancellation Type) to the old SGSN. The Cancellation Type indicates the old MME/SGSN to release the old Serving GW resource. Step 10. If there are active bearer contexts in the old MME/SGSN for this particular UE, the old MME/SGSN deletes these bearer contexts by sending Delete Session Request (LBI) messages to the GWs involved. The GWs return Delete Session Response (Cause) message to the old MME/SGSN. If a PCRF is deployed, the PDN GW employs an IP CAN Session Termination procedure as defined in 3GPP TS 23.203 to indicate that resources have been released. Step 11. The HSS acknowledges the Update Location message by sending an Update Location Ack (IMSI, Subscription data) message to the new MME. The Subscription Data contain one or more PDN subscription contexts. Each PDN subscription context contains an 'EPS subscribed QoS profile' and the subscribed APN-AMBR. The new MME validates the UE's presence in the (new) TA. If due to regional subscription restrictions or access restrictions (e.g. CSG restrictions) the UE is not allowed to attach in the TA or due to subscription checking fails for other reasons, the new MME rejects the Attach Request with an appropriate cause. If all checks are successful then the new MME constructs a context for the UE. If the APN provided by the UE is not allowed by subscription, or the Update Location is rejected by the HSS, the new MME rejects the Attach Request from the UE with an appropriate cause. The Subscription Data may contain CSG subscription information. For an Emergency Attach the MME shall not check for access restrictions, regional restrictions or subscription restrictions (e.g. CSG restrictions). For an Emergency Attach, the MME shall ignore any unsuccessful Update Location Response from HSS and continue with the Attach procedure. Step 12. For an Emergency Attach the MME applies the parameters from MME Emergency Configuration Data for the emergency bearer establishment performed in this step and any potentially stored IMSI related subscription data are ignored by the MME. If the UE performs Initial or Handover Attach via a CSG cell and there is no subscription for that CSG or the CSG subscription is expired the MME shall reject the Attach Request with an appropriate cause. If the UE has this CSG ID on its Allowed CSG list the UE shall remove the CSG ID from the list when receiving this reject cause. If a subscribed PDN address is allocated for the UE for this APN, the PDN subscription context contains the UE's IPv4 address and/or the IPv6 prefix and optionally the PGW identity. If the PDN subscription context contains a subscribed IPv4 address and/or IPv6 prefix, the MME indicates it in the PDN address. For Request Type indicating "Initial request", if the UE does not provide an APN, the MME shall use the PGW corresponding to the default APN for default bearer activation. If the UE provides an APN, this APN shall be employed for default bearer activation. For Request Type indicating "Handover", if the UE provides an APN, the MME shall use the PGW corresponding to the provided APN for default bearer activation, If the UE does not provide an APN, and the subscription context from HSS contains a PGW identity corresponding to the default APN, the MME shall use the PGW corresponding to the default APN for default bearer activation. The case where the Request Type indicates "Handover" and the UE does not provide an APN, and the subscription context from HSS does not contain a PDN GW identity corresponding to the default APN constitutes an error case. If the Request Type indicates "Initial request" and the selected PDN subscription context contains no PGW identity the new MME selects a PGW. If the PDN subscription context contains a dynamically allocated PGW identity and the Request Type does not indicate "Handover" the MME may select a new PGW as described in clause PGW selection function, e.g. to allocate a PGW that allows for more efficient routing. The new MME selects a SGW and allocates an EPS Bearer Identity for the Default Bearer associated with the UE. Then it sends a Create Session Request message to the selected SGW. User CSG Information includes CSG ID, access mode and CSG membership indication. If the Request Type indicates "Emergency", Maximum APN restriction control shall not be performed. For emergency attached UEs IMSI is included if available and if the IMSI cannot be authenticated then the IMSI shall be marked as unauthenticated. The RAT type is provided in this message for the later PCC decision. The subscribed APN AMBR for the APN is also provided in this message. The MSISDN is included if provided in the subscription data from the HSS. Handover Indication is included if the Request Type indicates handover. Selection Mode indicates whether a subscribed APN was selected, or a non-subscribed APN sent by the UE was selected. Charging Characteristics indicates which kind of charging the bearer context is liable for. The MME may change the requested PDN type according to the subscription data for this APN. The MME shall set the Dual Address Bearer Flag when the PDN type is set to IPv4v6 and all SGSNs which the UE may be handed over to are Release 8 or above supporting dual addressing, which is determined based on node pre-configuration by the operator. The Protocol Type over S5/S8 is provided to Serving GW which protocol should be used over S5/S8 interface. The charging characteristics for the PS subscription and individually subscribed APNs as well as the way of handling Charging Characteristics and whether to send them or not to the P GW is defined in 3GPP TS 32.251. The MME shall include Trace Reference, Trace Type, Trigger Id, and OMC Identity if SGW and/or PGW trace is activated. The MME shall copy Trace Reference, Trace Type, and OMC Identity from the trace information received from the HLR or OMC. The Maximum APN Restriction denotes the most stringent restriction as required by any already active bearer context. If there are no already active bearer contexts, this value is set to the least restrictive type . If the PGW receives the Maximum APN Restriction, then the PGW shall check if the Maximum APN Restriction value does not conflict with the APN Restriction value associated with this bearer context request. If there is no conflict the request shall be allowed, otherwise the request shall be rejected with sending an appropriate error cause to the UE. Step 13. The Serving GW creates a new entry in its EPS Bearer table and sends a Create Session Request message to the PDN GW indicated by the PDN GW address received in the previous step. After this step, the Serving GW buffers any downlink packets it may receive from the PGW without sending a Downlink Data Notification message to the MME until it receives the Modify Bearer Request message in step 23 below. The MSISDN is included if received from the MME. Step 14. If dynamic PCC is deployed and the Handover Indication is not present, the PDN GW performs an IP-CAN Session Establishment procedure as defined in 3GPP TS 23.203, and thereby obtains the default PCC rules for the UE. This may lead to the establishment of a number of dedicated bearers. The IMSI, APN, UE IP address, User Location Information (ECGI), UE Time Zone, Serving Network, RAT type, APN-AMBR, Default EPS Bearer QoS are provided to the PCRF by the PDN GW if received by the previous message. The User Location Information and UE Time Zone are used for location based charging. For emergency attached UEs which are unauthenticated the PGW provides the IMEI as the UE Identity instead of IMSI, to the PCRF. The PCRF may modify the APN-AMBR and the QoS parameters (QCI and ARP) associated with the default bearer in the response to the PDN GW as defined in 3GPP TS 23.203. If the PCC is configured to support emergency services and if dynamic PCC is deployed, the PCRF, based on the emergency APN, sets the ARP of the PCC rules to a value that is reserved for emergency services and the authorization of dynamic PCC rules as described in of 3GPP TS 23.203 . If dynamic PCC is not deployed, the PDN GW uses the ARP of the default emergency EPS bearer for any potentially initiated dedicated emergency EPS bearer. The PGW determines that emergency services are requested based on the emergency APN received in Create Session Request message. NOTE 7: While the PDN GW/PCEF may be configured to activate predefined PCC rules for the default bearer, the interaction with the PCRF is still required to provide e.g. the UE IP address information to the PCRF. NOTE 8: If the IP address is not available when the PDN GW performs the IP-CAN Session Establishment procedure with the PCRF, the PDN GW initiates an IP-CAN Session Modification procedure to inform the PCRF about an allocated IP address as soon as the address is available. In this version of the specification, this is applicable only to IPv4 address allocation. If dynamic PCC is deployed and the Handover Indication is present, the PDN GW executes a PCEF Initiated IP CAN Session Modification procedure with the PCRF as specified in 3GPP TS 23.203 to report the new IP CAN type. Depending on the active PCC rules, the establishment of dedicated bearers for the UE may be required. The establishment of those bearers shall take place in combination with the default bearer activation. This procedure can continue without waiting for a PCRF response. If changes to the active PCC rules are required, the PCRF may provide them after the handover procedure is finished. In both cases (Handover Indication is present or not), if dynamic PCC is not deployed, the PDN GW may apply local QoS policy. This may lead to the establishment of a number of dedicated bearers for the UE in combination with the establishment of the default bearer. If the CSG information reporting triggers are received from the PCRF, the PDN GW should set the CSG Information Reporting Action IE accordingly. Step 15. The P GW creates a new entry in its EPS bearer context table and generates a Charging Id. The new entry allows the P GW to route user plane PDUs between the S GW and the packet data network, and to start charging. The way the P GW handles Charging Characteristics that it may have received is defined in 3GPP TS 32.251. The PDN GW returns a Create Session Response message to the Serving GW. The PDN GW takes into account the received PDN type, the Dual Address Bearer Flag and the policies of operator when the PDN GW selects the PDN type to be used as follows. If the received PDN type is IPv4v6 and both IPv4 and IPv6 addressing is possible in the PDN but the Dual Address Bearer Flag is not set, or only single IP version addressing for this APN is possible in the PDN, the PDN GW selects a single IP version (either IPv4 or IPv6). If the received PDN type is IPv4 or IPv6, the PDN GW uses the received PDN type if it is supported in the PDN, otherwise an appropriate error cause will be returned. The PDN GW allocates a PDN Address according to the selected PDN type. If the PDN GW has selected a PDN type different from the received PDN Type, the PDN GW indicates together with the PDN type IE a reason cause to the UE why the PDN type has been modified. PDN Address may contain an IPv4 address for IPv4 and/or an IPv6 prefix and an Interface Identifier. If the PDN has been configured by the operator so that the PDN addresses for the requested APN shall be allocated by usage of DHCPv4 only, or if the PDN GW allows the UE to use DHCPv4 for address allocation according to the Address Allocation Preference received from the UE, the PDN Address shall be set to 0.0.0.0, indicating that the IPv4 PDN address shall be negotiated by the UE with DHCPv4 after completion of the Default Bearer Activation procedure. For external PDN addressing for IPv6, the PDN GW obtains the IPv6 prefix from the external PDN using either RADIUS or Diameter client function. In the PDN Address field of the Create Session Response, the PDN GW includes the Interface Identifier and IPv6 prefix. The PDN GW sends Router Advertisement to the UE after default bearer establishment with the IPv6 prefix information for all cases. If the PDN address is contained in the Create Session Request, the PDN GW shall allocate the IPv4 address and/or IPv6 prefix contained in the PDN address to the UE. . The PDN GW derives the BCM based on the NRSU and operator policy. Protocol Configuration Options contains the BCM as well as optional PDN parameters that the P GW may transfer to the UE. These optional PDN parameters may be requested by the UE, or may be sent unsolicited by the P GW. Protocol Configuration Options are sent transparently through the MME. When the Handover Indication is present, the PDN GW does not yet send downlink packets to the S GW; the downlink path is to be switched at step 23a. Step 16. If the MS Info Change Reporting Action (Start) and/or the CSG Information Reporting Action (Start) are received for this bearer context, then the S GW shall store this for the bearer context and the SGW shall report to that PGW whenever a UE's location and/or User CSG information change occurs that meets the PGW request. The Serving GW returns a Create Session Response message to the new MME. Step 17. If an APN Restriction is received, then the MME shall store this value for the Bearer Context and the MME shall check this received value with the stored value for the Maximum APN Restriction to ensure there are no conflicts between values. If the Bearer Context is accepted, the MME shall determine a (new) value for the Maximum APN Restriction. If there is no previously stored value for Maximum APN Restriction, then the Maximum APN Restriction shall be set to the value of the received APN Restriction. MME shall not deactivate bearer(s) with emergency ARP, if present, to maintain valid APN restriction combination. The PGW shall ignore Maximum APN restriction if the request includes the Emergency APN. If the MS Info Change Reporting Action (Start) and/or the CSG Information Reporting Action (Start) are received for this bearer context, then the MME shall store this for the bearer context and the MME shall report whenever a UE's location and/or User CSG information change occurs that meets the request. The MME determines the UE AMBR to be used by the eNodeB based on the subscribed UE-AMBR and the APN AMBR for the default APN. For emergency attach the MME determines the UE-AMBR to be used by the eNodeB from the APN AMBR received from the S-GW. The new MME sends an Attach Accept message to the eNodeB. GUTI is included if the new MME allocates a new GUTI. This message is contained in an S1_MME control message Initial Context Setup Request. This S1 control message also includes the AS security context information for the UE, the Handover Restriction List, the EPS Bearer QoS, the UE-AMBR, EPS Bearer Identity, as well as the TEID at the Serving GW used for user plane and the address of the Serving GW for user plane. In the Attach Accept message, the MME does not include the IPv6 prefix within the PDN Address. The MME includes the EPS Bearer QoS parameter QCI and APN-AMBR into the Session Management Request. Furthermore, if the UE has UTRAN or GERAN capabilities and the network supports mobility to UTRAN or GERAN, the MME uses the EPS bearer QoS information to derive the corresponding PDP context parameters QoS Negotiated (R99 QoS profile), Radio Priority, Packet Flow Id and TI and includes them in the Session Management Request. If the UE indicated in the UE Network Capability it does not support BSS packet flow procedures, then the MME shall not include the Packet Flow Id. The MME sets the IMS Voice over PS session supported Indication. LCS Support Indication indicates whether the network supports the EPC-MO-LR and/or CS-MO-LR as described in 3GPP TS 23.271. If the UE initiates the Attach procedure at a hybrid cell, the MME shall check whether the CSG ID is contained in the CSG subscription and is not expired. The MME shall send an indication whether the UE is a CSG member to the RAN along with the S1-MME control message. Based on this information the RAN may perform differentiated treatment for CSG and non-CSG members. If the MME or PDN GW has changed the PDN Type, an appropriate reason cause shall be returned to the UE. For an emergency attached UE, i.e. for UEs that have only emergency EPS bearers established, there is no AS security context information included in the S1 control messages and there is no NAS level security when the UE cannot be authenticated. The Emergency Service Support indicator informs the UE that Emergency bearer services are supported, i.e. the UE is allowed to request PDN connectivity for emergency services. Step 18. The eNodeB sends the RRC Connection Reconfiguration message including the EPS Radio Bearer Identity to the UE, and the Attach Accept message will be sent along to the UE. The UE shall store the QoS Negotiated, Radio Priority, Packet Flow Id and TI, which it received in the Session Management Request, for use when accessing via GERAN or UTRAN. The APN is provided to the UE to notify it of the APN for which the activated default bearer is associated. The UE may provide EPS Bearer QoS parameters to the application handling the traffic flow(s). The application usage of the EPS Bearer QoS is implementation dependent. The UE shall not reject the RRC Connection Reconfiguration on the basis of the EPS Bearer QoS parameters contained in the Session Management Request. If the attach procedure is initiated by manual CSG selection and occurs via a CSG cell, the UE upon receiving the Attach accept shall check if the CSG ID of the cell where the UE has sent the Attach Request message is contained in its Allowed CSG list. If the CSG ID is not in the UE's Allowed CSG list, the UE shall add the CSG ID to its Allowed CSG list. Manual CSG selection is not supported when an emergency service has been initiated. NOTE 9: If the UE receives an Attach Accept message via a hybrid cell, the UE does not add the corresponding CSG ID to its Allowed CSG list. Adding a CSG ID to the UE's local Allowed CSG list for a hybrid cell is performed only by OTA or OMA DM procedures. When receiving the Attach Accept message the UE shall set its TIN to "GUTI" as no ISR Activated is indicated. If the UE receives an IPv4 address set to 0.0.0.0, it may negotiate the IPv4 address with DHCPv4. If the UE receives an IPv6 interface identifier, it may wait for the Router Advertisement from the network with the IPv6 prefix information or it may send a Router Solicitation if necessary. NOTE 10: The IP address allocation details are described in clause 5.3.1 on "IP Address Allocation". Step 19. The UE sends the RRC Connection Reconfiguration Complete message to the eNodeB. Step 20. The eNodeB sends the Initial Context Response message to the new MME. This Initial Context Response message includes the TEID of the eNodeB and the address of the eNodeB used for downlink traffic on the S1_U reference point. The MME shall be prepared to receive this message either before or after the Attach Complete message (sent in step 22). Step 21. The UE sends a Direct Transfer message to the eNodeB, which includes the Attach Complete message. Step 22. The eNodeB forwards the Attach Complete message to the new MME in an Uplink NAS Transport message. After the Attach Accept message and once the UE has obtained a PDN Address, the UE can then send uplink packets towards the eNodeB which will then be tunnelled to the Serving GW and PDN GW. If the UE requested for a dual address PDN type (IPv4v6) to a given APN and was granted a single address PDN type (IPv4 or IPv6) by the network with a reason cause indicating that only single IP version per PDN connection is allowed sent together with the PDN type, the UE should request for the activation of a parallel PDN connection to the same APN with a single address PDN type (IPv4 or IPv6) other than the one already activated. If the UE receives no reason cause in step 18 in response to an IPv4v6 PDN type and it receives an IPv6 Interface Identifier apart from the IPv4 address or 0.0.0.0 in the PDN Address field, it considers that the request for a dual address PDN was successful. It can wait for the Router Advertisement from the network with the IPv6 prefix information or it may send Router Solicitation if necessary. Step 23. Upon reception of both, the Initial Context Response message in step 20 and the Attach Complete message in step 22, the new MME sends a Modify Bearer Request message to the Serving GW. Step 23a. If the Handover Indication is included in step 23, the Serving GW sends a Modify Bearer Request (Handover Indication) message to the PDN GW to prompt the PDN GW to tunnel packets from non 3GPP IP access to 3GPP access system and immediately start routing packets to the Serving GW for the default and any dedicated EPS bearers established. Step 23b. The PDN GW acknowledges by sending Modify Bearer Response to the Serving GW. Step 24. The Serving GW acknowledges by sending Update Bearer Response (EPS Bearer Identity) message to the new MME. The Serving GW can then send its buffered downlink packets. Step 25. After the MME receives Modify Bearer Response (EPS Bearer Identity) message, if Request Type does not indicate handover and an EPS bearer was established and the subscription data indicates that the user is allowed to perform handover to non-3GPP accesses, and if the MME selected a PDN GW that is different from the PDN GW identity which was indicated by the HSS in the PDN subscription context, the MME shall send a Notify Request including the APN and PDN GW identity to the HSS for mobility with non-3GPP accesses. The message shall include information that identifies the PLMN in which the PDN GW is located. For an Emergency Attach the MME shall not send any Notify Request to an HSS. Step 26. The HSS stores the APN and PDN GW identity pair and sends a Notify Response to the MME. 3GPP TS 23.401 including Fig.1. After LTE is successfully attached, does LTE uplink Tx power still keep ON? Hi, I have a query regarding Cancel Location sent by a post rel 8 HLR. Lets assume that the Cancellation Type is Update Procedure - Initial Attach.Now this could be supported only by an S4-SGSN. So if the HLR is sending a Cancel Location with Update Type -Initial Attach, how does it know that it is sending the Can Loc msg to an S4-SGSN and not to a Gn/Gp SGSN? What should be the ideal approach on handling UE for failed (CAC) dedicated bearer (ERAB),should we allow the UE to stay in eNBby with only default DRB or redirect the UE to other basestation ? UE request for a dedicated DRB of perticular QOS, due to non availablinity fo resource ,eNB cannot admit that DRB. should we allow the UE to stay in eNBby with only default DRB and sending caue for failure to MME or redirect the UE to other basestation ?